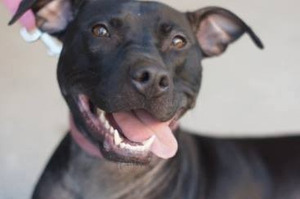 Ohio Pit Bull Terrier mix Ladybug is getting a second chance at a great and pain-free life today thanks to a life-changing leg surgery. Ever since Ladybug’s surgery, foster cat Jezzebelle has been taking care of the recovering pooch. In the spring of 2012, when Ladybug was only 5-months-old, she was taken in by the Lucas County Canine Care & Control. There, she spent 6 long months in a kennel before she was transferred out to Planned Pethood, an animal rescue group based in Toledo. That’s when she met Michelle Wasylecki, who fostered Ladybug until she was adopted by a family. It seemed like Ladybug would finally have her happy ending. But only a year later, her family returned her to the rescue because they were moving. But Wasleckyi’s boyfriend, Greg Lyons, believes Ladybug might have been returned for another reason — a leg condition and the expenses involved in correcting that condition. Ladybug’s legs had always been a little different, but until recently she was able to keep her injury from getting in the way of having fun. As the cold air rolled into Ohio in October and November, Ladybug’s back legs stiffened even more, and she made sure to put as much weight on her front legs while walking as possible. A visit to the vet revealed that because of a problem with Ladybug’s kneecaps and ankles, she’d torn both of her Anterior Cruciate Ligaments (ACLs). Not only could Ladybug not walk, sit, or stand normally, it was clear she was in excruciating pain. Ladybug needed surgery, and soon. When Wasylecki realized the extent of Ladybug’s injuries and the expense involved in getting Ladybug the corrective surgery she needed, she knew she’d need some help. On December 5, she started a fundraising campaign on GoFundMe.com, and created the Ladybug and her Broken Wings Facebook page. Just 10 days later, the $2,100 Ladybug needed for her double-ACL surgery had been raised. Finally, on January 3, Ladybug underwent surgery to repair her knee joints and ACLs. Wasylecki says Ladybug is still recovering, but doing well. The energetic Pittie girl isn’t enjoying her mandatory bed rest, but keeping her crated or on a leash 24 hours a day is essential for the healing process. “She’s definitely frustrated,” Lyons says. While Ladybug is busy getting well, she has also found a buddy in her foster mom’s tabby cat, Jezzebelle. Ladybug will spend the next two months recuperating at her foster mom’s house before Planned Pethood makes her available for adoption. But for Wasylecki, parting with the dog she’s known and cared for is definitely going to be such sweet sorrow. “She’ll be very difficult to let go. She’s a sweet dog,” she says of Ladybug. If you want to learn more about Ladybug, or are interested in completing an adoption application, check out the Planned Pethood website or Facebook page.